What you’ll see (and hear) during the eclipse! No matter where you are in North America on August 21, 2017 the new audio cues feature will guide you through the Great American Total Eclipse of 2017. Read on to learn what you will see and now hear during the solar eclipse. Warning: Using event timers and audio cues never implies it is safe to take off any type of eye protection at any time when observing the Sun. This app’s calculations are estimations and are not guaranteed. Please use caution, as it is never safe to view the Sun (eclipsed or otherwise) without proper and certified eye protection. To demonstrate all audio cues, you may “time travel” by long-pressing an eclipse circumstance such as “Partial Eclipse Begins” or “Total Eclipse Begins”. Long press circumstances for time travel mode and audio cue demo. Audio cues may be turned on or off in the app drawer menu on the left. Turning on the audio cues will play the “Three Beep Cue” for demo purposes and app volume awareness. Voice Cues: You will hear a voice say each eclipse circumstance approximately 7 to 10 seconds before the occurrence begins. The Three Beep Cue: As eclipse circumstances occur you will hear two longer tones and a final third higher pitched short beep. The third beep marks, as accurately as is possible, the actual start of each eclipse occurrence. “First Contact” (Cue Beeps) (Occurs in all locations in North America): This is the moment the eclipse starts as the Moon first “contacts” the solar disk as observed from your location. In reality, you probably will not see anything, as it usually takes a few minutes for the first “bite” out of the Sun to be visible. Crescent shaped solar images created by the shadow of a tree. For those outside the path of totality, the partial solar eclipse is still worth viewing. In almost all locations in the United States, the Sun will be covered enough so that it will be noticeably darker. No dramatic darkening, per se, but just enough to notice. In fact, it will also be enough to cool the air temperature, providing some relief for a hot, August afternoon. A safe and properly filtered view of the eclipse will reveal the jagged edges of the Moon back-lit by the Sun. 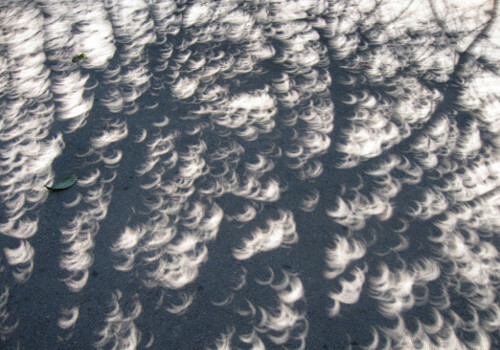 Shadows cast by trees will reveal thousands of crescent shaped solar eclipse images. As the solar image itself is no longer round, but crescent-shaped, your own shadow will look rough and odd. While partial solar eclipses are fairly regular occurrences, such a deep magnitude partial solar eclipse is still fairly rare and worth at least of few moments to enjoy. “Look for Shadow Bands” (Only visible from the narrow path of totality): Possibly observed 45 seconds prior to second contact, then again after third contact for up to 45 seconds. 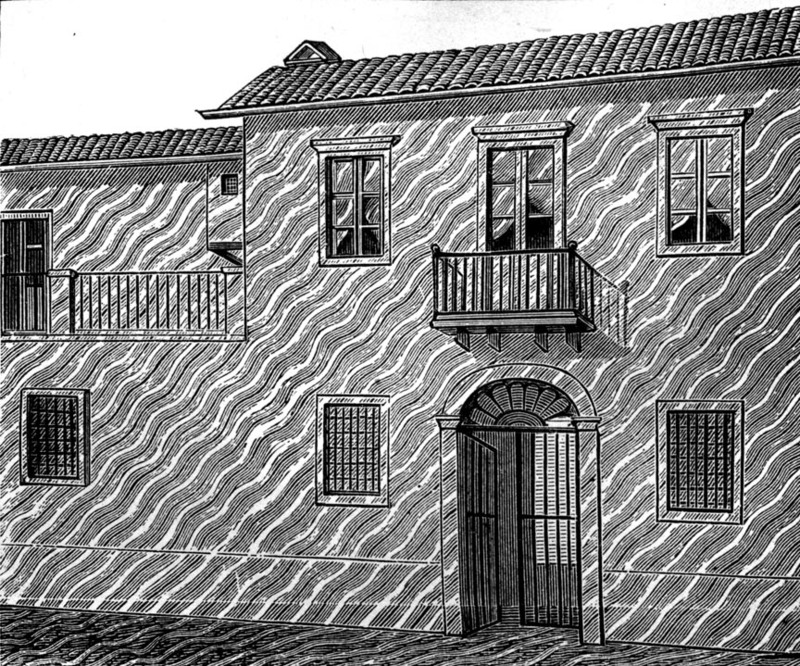 Artistic rendition of shadow bands. As the Moon covers most of the Sun and only a small narrow sliver of light is left, the phenomenon of shadow bands may occur. They are best viewed on a smooth, light-colored surface on the ground and can often look like the shimmering bands of light seen on the bottom of a swimming pool. They may not always be visible, but in some cases can be strong enough for children to chase after them. Most scientist believe shadow bands are caused by normal atmospheric turbulence. However, a recent hypothesis has suggested that the eclipse itself causes the shadow bands: As the Moon’s shadow races across the Earth at thousands of miles per hour, it is known to cause atmospheric cooling. Therefore, a relatively cool area of atmosphere is being created at hyper-sonic velocities creating a bow shock . The last narrow sliver of sunlight passes through these bow-shock waves creating the shadow bands effect. More information is required to prove this hypothesis. It may be possible that this eclipse, itself, will provide enough evidence. “Look for Baily’s Beads” (Only visible from the narrow path of totality): Observed approximately 20 seconds prior to second contact, then again after third contact for another 20 seconds. As the Moon is now almost completely covering the solar disk, just a few specs of light continue to shine through the rough surface of the Moon. From a naked-eye perspective, the Moon looks almost perfectly smooth: However, in reality, the Moon’s surface is complicated by craters, canyons, valleys, and mountains. As the Sun shines through these irregularities on the lunar surface, they are presented as beads of light. “Look for diamond ring effect” (Only visible from the narrow path of totality): Mere seconds before second contact to seconds after third contact. Also known as The last Baily’s Bead: Right before the Sun is completely covered by the Moon, one last bit of sunlight finds its way through a valley or canyon on the Moon. The Sun’s corona just starts to become visible. Now the entire circular outline of the Moon is visible with one bright spot of light: Hence, a ring-like structure with one bright diamond-like bit of sunlight is visible. “Second Contact (Cue Beeps)” (Only occurs from the narrow path of totality): The Moon has now completely covered the Sun and totality has begun. The air has cooled and the near darkness of a night sky in the middle of the day occurs. Bright stars and planets will be visible. The Sun’s atmosphere, the corona, is visible and surrounds the Moon as a bright wispy cloud-like structure. Close-in views of the totally-eclipsed Sun will reveal solar flares peaking out around the Moon. “Mid Eclipse (Cue Beeps)” (Occurs in all locations in North America): This is the half-way point of the eclipse. If you are not in the path of totality then this is the point at which the Sun is most eclipsed. In the path of totality this is when the Sun and Moon are most aligned. “Third Contact (Cue Beeps)” (Only occurs from the narrow path of totality): Totality has now ended and Moon has begun to reveal the Sun again. The diamond ring effect, Baily’s Beads, and shadow bands may be visible in the reverse order they were seen prior to second contact. Due to the quick reverse-succession of these phenomenon, no voice cues will be heard. “Fourth Contact (Cue Beeps)” (Occurs in all locations in North America): The eclipse has ended. The Moon no longer covers any part of the Sun. Time to start planning your next eclipse adventure.